She slept in designer cave rooms I couldn’t afford. But I also give a thumbs up to the restaurant Alaturca in Goreme. It was my best meal in the region. Be sure to click on the slide show link on the left of the text in the article. Yoray Liberman’s photos are thrilling. I arrived at JFK on a day New York taxi drivers were out on strike. “This is going to cost me,” I muttered to myself as I queued up with others heading Big Apple-ward. I wondered what the taxi driver’s little book would say the fare is to get me to Jersey City, where I’m temporarily staying, thanks to the kindness and generosity of my friend Marie. The final tally — about $100 — basically the money the fellowship saved on airfare by sending me to JFK instead of Newark. As I left Cairo at around 1 am on Tuesday night — after saying goodbye to J&K (that’s them in the photo, with Jack giving me a final wet willie before I left) who had been so kind to put me up (and put up with me) for a couple of weeks — I made note of each landmark I passed, realizing that all the places I had driven by in various trips in rattly Cairo cabs, I would not see again for some time. I soaked in my last view of the Nile. Looked out at grand mosques and churches that seem to line the elevated highway on the way to the airport. And heard for the last time a taxi driver tell me where Mubarak lives, off the main airport road in Heliopolis. It was the tail end of rush hour when the taxi driver pulled away from JFK and headed across Queens toward Manhattan. With conservative talk radio on the AM dial blaring on the stereo (a little like hearing imams shouting and chanting on radios in Cairo cabs), my traffic-averse driver swept onto every highway on-ramp whenever he saw traffic ahead. This made for a circuitous tour of New York City, taking in all the geography of a traffic report on 1010WINS morning radio. He swung north to cruise by LaGuardia airport, then onto the Brooklyn Queens Expressway (the BQE) toward my old neighborhood in Brooklyn. Seeing traffic ahead on the BQE, he darted right and took the Queens Midtown tunnel into Manhattan. As he crossed the island (a little bigger than Zamalek in Cairo), I made calls on the cell phone that had been dormant for a year, ticking off one by one the list of friends in the contacts of the phone’s memory. The cab turned left on the West Side highway, and I got my first glimpse of the Hudson in more than a year; the sun setting, and people enjoying the waterfront at all the renewed parks and attractions on its banks. This is a very different river from the Nile, though not as much as I thought a year ago. 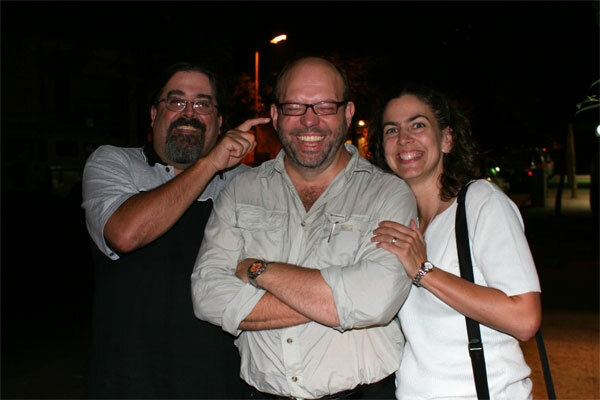 In my two days of adjusting so far to life here, I’m doing pretty well, I think, with a little help from my friends. I’ve already had two nights of welcome back dinners and drinks with good pals. I’m getting used to the money being all the same color (more or less) and size. When I cleaned out the pockets of the pants I wore on the flight home, I laughed to myself as I pulled an Egyptian 5 pound note from the left pocket. Five Egyptian pounds was the cost of a taxi ride from my pad to the AUC office (about 88 cents). But change — fakka in Egyptian Arabic — is not easy to come by, and taxi drivers are notorious for not having any as a strategy for a hefty roundup of the fare (mafish fakka, they say, “I have no change.” Then mish mushkela, “no problem” making gestures that the extra is worth more to him than it is to me). So I would almost jump with glee whenever I got five pound notes as change, and I’d stuff them in my left pocket, separate from the other denominations in my right pocket, so I would always have one handy for the commute. It’s a habit I won’t need to continue here in New York (a fistful of Lincolns doesn’t hold the same cachet), but it does feel strange to have coins in my pocket instead of a wad of piasters, the flimsy and well-worn bills that serve as pennies and nickels in Egypt. Staying in Marie‘s, I was immediately comfortable. A quick look around showed it was clearly the home of a comic book editor and traveler. But it was also immediately clear why we are good friends. The knick knack shelf has lots of familiar souvenirs from places I’ve also traveled, and others I hope to visit (particularly Antarctica). A quick scan of the bookshelves showed countless Boolean connections: guidebooks for nearly every region of the globe, and lots of authors in common (Shakespeare, Alaa Al-Aswany, Joseph Campbell, Geoff Ryman, and my friend Dan Piraro). And among them is Marie’s most recent book Stalking the Wild Dik Dik, which I have been looking forward to reading. In between chapters, I’ll work on my backlog of stories from my final days overseas. And I’ll share some photos. If you read Marie’s blog today, you’ll know that I’ve spent the entire day tied to the apartment, waiting for the Verizon folks to come and get the DSL working again. It gave me time to write this post. But it’s after 4, and I have yet to hear from anyone. I began this blog more than a year ago as a means to keep friends and family back home up to date on my life and adventures in the Middle East. Now that I’m back, you probably won’t care so much what I’m up to, with familiar ho-hum activities of American life. But I’ll likely continue the blog to keep the friends and colleagues I’ve gotten to know this past year in touch with my life and exploits on this side of the Atlantic. The cover of the previous edition of the Lonely Planet guidebook for Turkey features a photograph of a stone head, its face filled with cracks as though it were made from dried mud, sitting among boulders and scree, soaking in the sunset. Among the icons of Turkey – the flag, the fez, the whirling dervish, the Blue Mosque, the ubiquitous face of Atatürk, the famous rugs – the strange and glorious heads of Mt. Nemrut … big … weird… easily find their place. So I was faced with a dilemma: do I continue to enjoy the hiking in the fabulous valleys of stone pillars in Cappadocia (there are so many trails, I could spend weeks here), or do I go see the big weird heads? As I mentioned in a previous dispatch, it was like the flip of a coin: heads or trails. My biggest reservation was time, since you have to travel so far, into the Southeastern Anatolia region of the country, the last chapter in the more than 600 pages of guidebook. When I discovered a tour group was giving a good price on a tour that would leave in time for me to enjoy the geo-cephalic site and still have a few days to get back west to the Aegean, I put down my Euros (wincing at the exchange rate… damn you weak dollar! ), and packed my bags. There are two things about Mt. 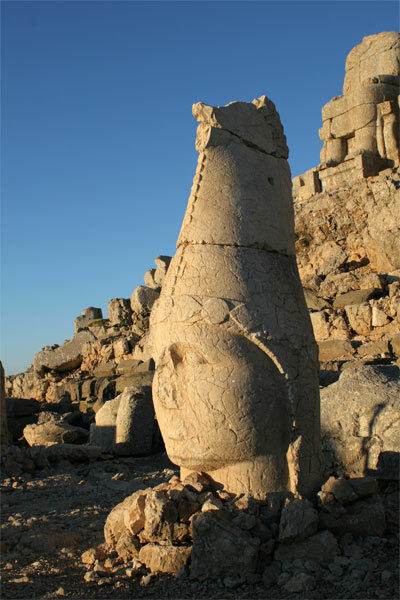 Nemrut National Park that are misnomers. First, the Mt. Nemrut that you stand on when you walk to the summit is not the only Mt. 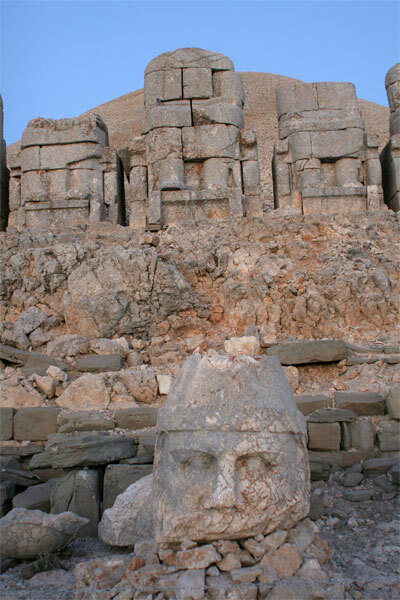 Nemrut in Turkey. The other mountain is further east, towering more than nine-thousand feet above Lake Van. 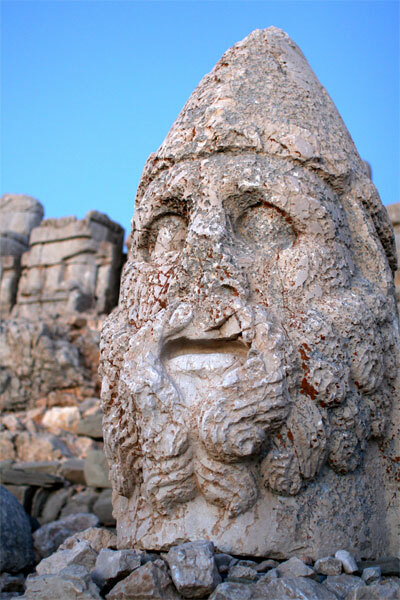 And, second, the giant stone figures on the mountaintop were not created by Nemrut, also known as Nimrod (he of Genesis, way before Phil Collins). They were commissioned by King Antiochus I Epiphanes who had an epiphany (ahem), and placed himself in the middle of figures of the gods: sun god Apollo; Fortuna; Zeus; Antiochus, and then Heracles. This is where he believed he would be when he died – among the gods. The gods his people worshiped were an unusual amalgam of Greek and Persian gods. The stone heads were once on top of appropriately proportioned stone bodies. The five statues, flanked by lions and ravens on each end, stood atop the mountain in two sets, one facing east, the other west, saluting the sun at dawn and dusk. As the old saying goes, “heads will roll.” Especially after sitting atop stone bodies over thousands of years, and suffering erosion and earthquakes. So the heads, free from their stone necks, tumbled downhill. Now they sit in a row on the mountain’s eastern side, placed below the figures of their bodies, greeting the sunrise each morning with the same expression they’ve held for more than 2,000 years.